"And now for the big silver report. Four customers (not dealers) withdrew a total of 1,019,310 oz from the comex vaults. This is real silver leaving from 4 registered vaults. The individual withdrawals are: 579,081, 30,380, 399,994 and 9855 oz. 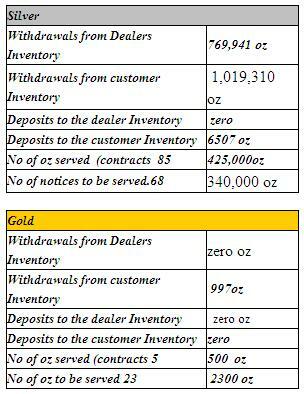 The dealer (our bankers) also were involved in the withdrawal of silver to the tune of 769,941 oz (there were 2 dealers involved removing 102,866 and 667,875 ozs). When you see this massive drain of silver, the fire is raging. The total silver withdrawal by both dealer and customer totalled an astronomical 1,789,251. The Brink's trucks must have been very busy yesterday. The comex folk notified us that an amazing 85 notices were sent down for servicing for a total of 425,000 oz of silver. The total number of silver notices sent down so far total 323 or 1,615,000 oz. To obtain what is left to be served, I take the open interest for January at 153 and subtract 85 deliveries leaving a total of 68 notices or 340,000 oz left to be serviced. 1,615,000 oz + 340,000 = 1,955,000 oz (Thursday total = 1,625,000). As promised to you, this number is rising and will continue to rise until the end of the month as our banker cartel scrambles to get any morsel of silver to satisfy the massive demand for this metal. Our bankers are stunned to see such a huge amount of silver options in a traditionally slow month. I hope everyone caught the Eric Sprott story on Kingworld news that he is having trouble locating silver." 10 Jan 11, 04:52 How Many lots is a million ounces of Silver ?